When it rains here, you're not just walking a short distance to your car with the ability of doing errands via drive-thru. You carry your groceries in it, you walk to work in it, you end up lost in it. and then there is RAIN. This past Saturday was unfortunately the latter; the rain was coming down so hard and the wind was blowing so strong that my umbrella snapped inside out and blew away. Yes, it just up and left me, high and (not) dry. Does that even happen to normal people? Have I just racked up that much bad karma with inanimate objects? Where did it go? 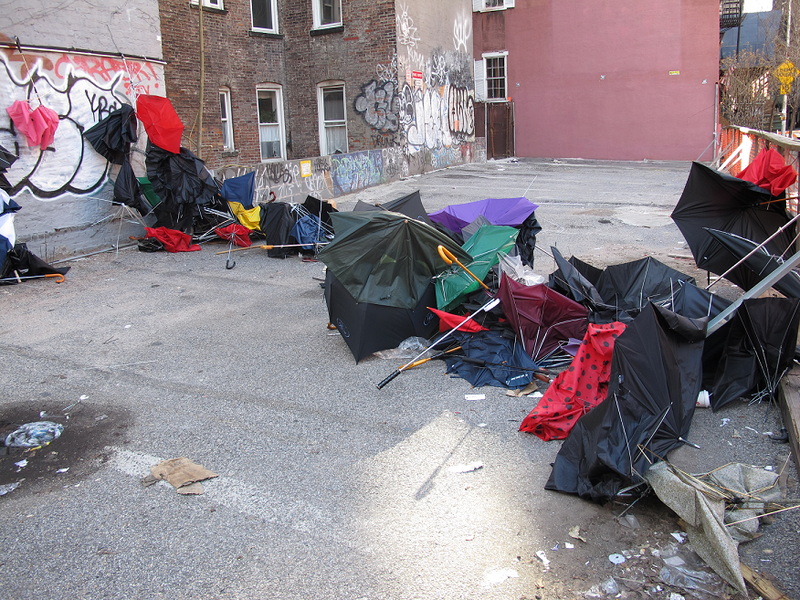 I'm fairly certain it's dead in some umbrella graveyard. When living in NYC, you quickly learn that you will go through about 17 umbrellas per season, the majority of which you buy from a table on the street when you've realized you forgot to bring one with you. Ya know, since the last storm killed yours and you've been consumed with so much denial that it's happened yet again that you haven't bought a new one. 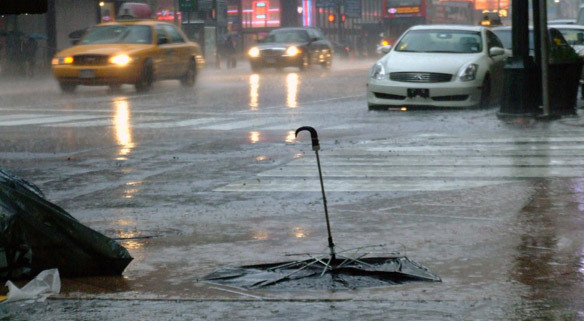 Most times, your umbrella doesn't just blow away...usually a "limb" is broken and you continue to use the lopsided ghetto device until it no longer opens at all. And you're stuck underneath a store awning. And you're wearing suede shoes. Then, of course, you pay more than you want to the umbrella-stand-man for a lousy boring black and poorly constructed umbrella out of pure desperation. I hopefully ended this awful cycle on Sunday after buying a new umbrella from Lulu Guinness. 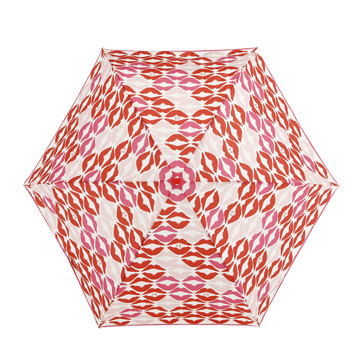 I know, I know, it seems ridiculous to spend 40-something dollars on an umbrella! But I suppose it also seems ridiculous to have gone through 4 umbrellas since Christmas. Yes. If you go into the store on Bleeker Street in NYC (the only store in the US) and buy an umbrella, they take down your name and if at any point during the year of purchase (yes, an entire year) anything breaks on the umbrella for whatever reason, you can bring it in and they will give you a new one for free. I stood there dumbfounded and must have repeated "so let me get this straight..." five times while the enthusiastic salesperson assured me that I wasn't going deaf. Apparently it's made out of some indestructible material? Hello, magic wand. I'm not sure if this deal works for online purchases, but it couldn't hurt to check. To purchase online, click here. Now I just have to make sure I don't leave it in a cab. Heh. Are you in need of other cute rain gear? 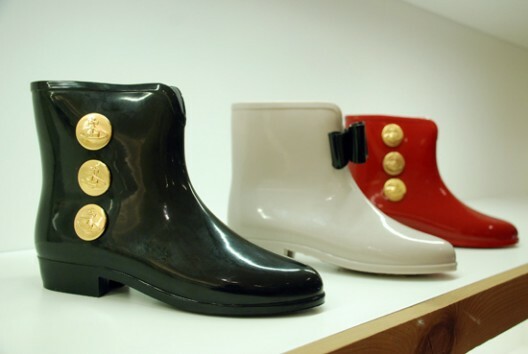 Melissa Shoes teamed up with Vivienne Westwood for these cute little short wellies. You can find them at Nida Boutique located at 573 Hudson Street in the West Village. To see more styles of shoes at the boutique, click here. Also, please check out the adorable All Things Fabulous blog and her recent post about Zoubaby's monogrammed rainboots. How cute are those?